To have the best possible time, plan your visit. It's easy, because you can leave the Mystic Seaport campus and return later, no problem. Fist things first: if you're not dependent on train schedules for your visit (ie, if you're coming by car), you don't have to worry about starting in the afternoon, because your admission fee is good for two days. You can stay the night in a hotel or motel in Mystic or nearby, and continue your visit the next day. If you don't have a lot of time, a morning or afternoon should be sufficient to get the best from the museum, but plan to stay at least three or four hours. That's pretty much the minimum time you'l need to fully enjoy Mystic Seaport. With your admission wristband (which allows you to leave the Mystic Seaport campus and return later in the day, if you wish), you'll be given a handsome map of the village and its exhibits, plus a list of the daily events, from special lectures to sea chantey singing. I'd suggest that you plan your river cruise(s) first, learn the schedules, and arrange to get on the cruise(s) you want. Next, if the weather is good, wander around the 19th-century village, which is the heart of Mystic Seaport. Each of the buildings has its own exhibits. You'll be strolling from one to another. At lunchtime, Mystic Seaport has several of its own restaurants, including the Seaman's Inne Restaurant & Pub, the Café & Bake Shoppe, and the Galley Restaurant. If you'd rather shop around, you can walk to the center of the town of Mystic in about 10 or 12 minutes. A variety of restaurants and snack stands awaits you there. In the afternoon, when you may be a bit tired, you may wish to be in the air-conditioned exhibit galleries or the planetarium (where you get to sit down)! In winter, interpreted exhibits and craft demonstrations don't begin until 10 am. Look at the list to get an idea of what'll be in action for the hours you're in the village. 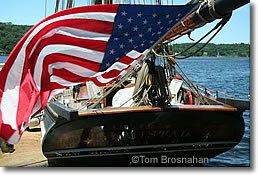 Above, the Amistad moored at Mystic Seaport, Mystic CT.